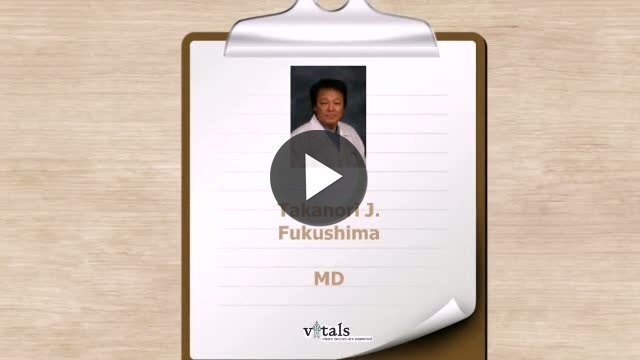 Dr. Takanori Fukushima, MD is a Doctor primarily located in Raleigh, NC. His specialties include Neurological Surgery. He speaks English. Dr. Fukushima has received 7 awards. The overall average patient rating of Dr. Takanori Fukushima is Great. Dr. Takanori Fukushima has been rated by 36 patients. From those 36 patients 11 of those left a comment along with their rating. The overall rating for Dr. Takanori Fukushima is 4.4 of 5.0 stars. The staff was very nice and easy to speak with.I had to wait over an hour to see Dr.Fukushima.As he entered the room,he never introduced himself,he begun telling me what surgery he was capable of,etc.He hardly looked into my eyes as he was speaking.It seemed it insulted him,that I came to him for anything as insignificant as face numbness.He reminded me my referring Dr.was just a Medical Neurologist,and he himself was a Neurosurgeon.He said I needed to be on a steroid but never offered to write a simple prescription.I am sorry I did not see or feel the compassion that I read about on his page.I will recommend my Neurologist to find another Neurosurgeon to refer his patients to.Bad experience. Ten years ago, Dr. Fukushima operated on my daughter's golf-ball sized, skull-based tumor when several other neurosurgeons would not touch it. Although she had a difficult recovery period, he saved her life and she is thriving! Dr. F did my surgery in 2009. My tumor was very rare and very hard to remove, but he had complete confidence that he would remove the tumor without complications. When I woke up from surgery, I had lost my ability to swallow and speak and half my face was paralyzed. I had to get a feeding tube and undergo months of speech therapy. Dr. Fukishima did not aide in my recovery. He claimed in the op report that he had removed the entire tumor, but a few months later I got an MRI and found that he had only removed one third of the tumor. Did I mention I was 16 years old when this happened? I had to have a second surgery to remove the tumor that he left with a different surgical team but they couldn't undo the nerve damage from my surgery with Dr. Fukushima. I'm sure he is a great surgeon, but make sure you explore all your options before committing to a surgery. I'm 22 years old and disabled because of this surgeon. Take a minute to learn about Dr. Takanori Fukushima, MD - Neurological Surgery in Raleigh, NC, in this video.